Posted in costume, Handmade, sewing for children	by ooobop! 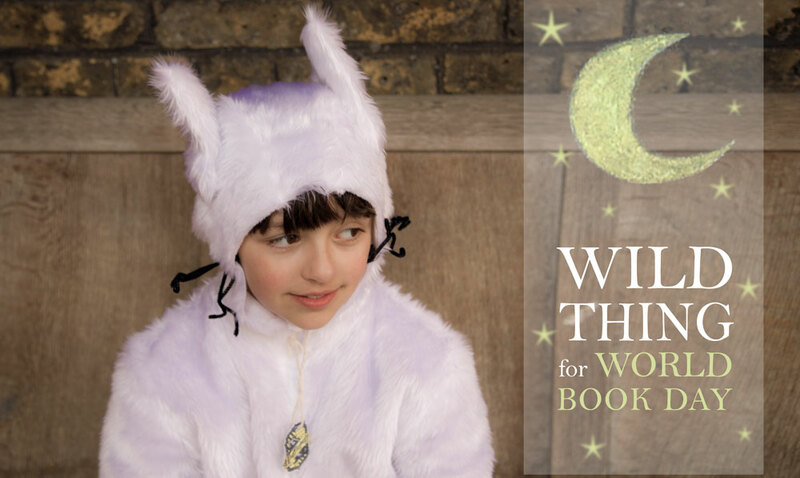 I think I may be subject to mass mum-hate if I proclaim a love for World Book Day. But I do. (Eek!) Don’t get me wrong, I get my knickers in a knot as much as anyone else but I secretly relish the challenge. After all, it involves a must-do sewing project. And that’s always a good thing. My daughter was very clear about what she wanted to be this year. I’ve come to realise recently, how very grateful I am for people who think for me. I constantly have head soup! Someone thinking on my behalf is better than doing the dishes for me or hoovering the stairs. I’d even go as far as saying that it was better than someone cleaning the bathroom for me. Not that I know what that’s like but you catch my drift? 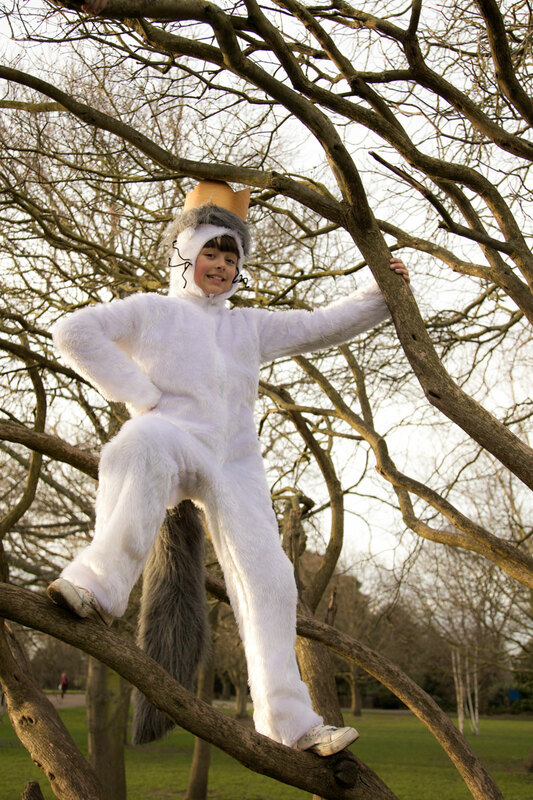 Anyhows, youngest dort was dead set on Max from Where The Wild Things Are. Easy I thought. 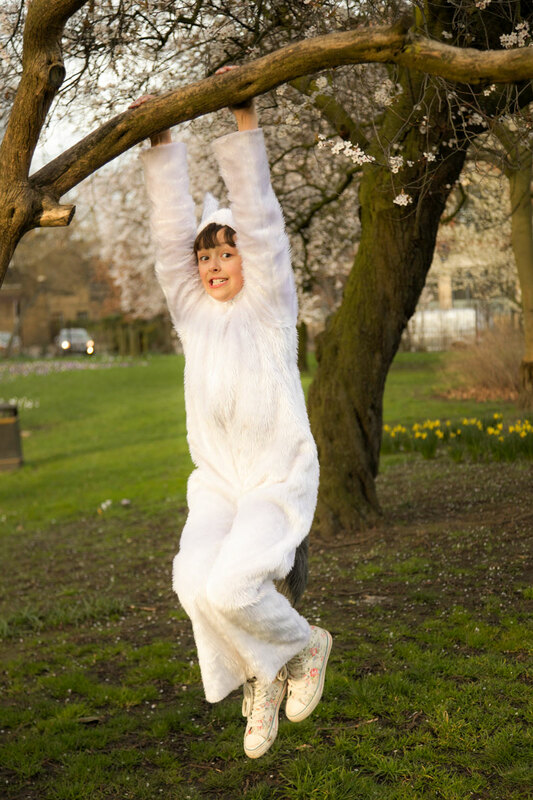 A white onesie and we are sorted! Not. 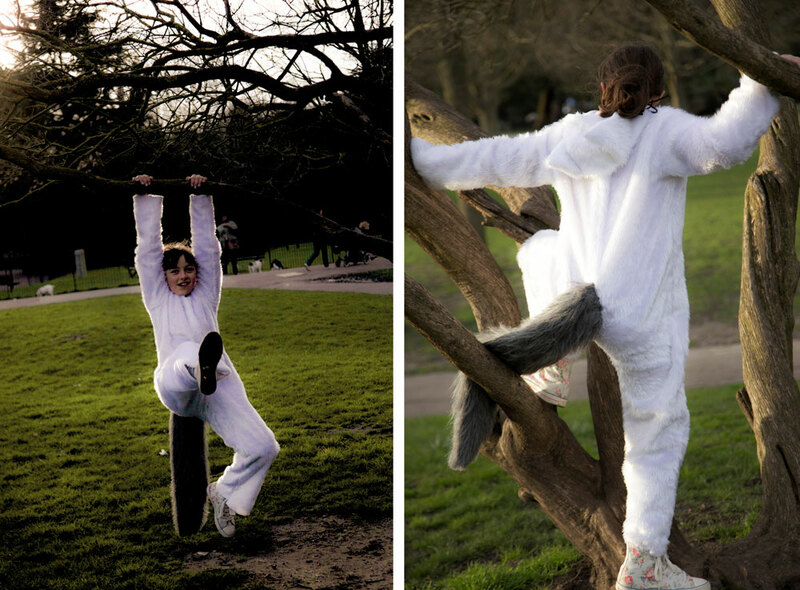 Not when youngest dort has other plans, like a white onesie in a faux fur of the furriest kind. I kid you not, this stuff is horrid and has left serious evidence throughout the whole house! I’ve never attempted one of these before and certainly didn’t have a go-to pattern but this is where I can justify my 3 year collection of Burdastyle magazines. Low and behold in January 2013’s edition…. 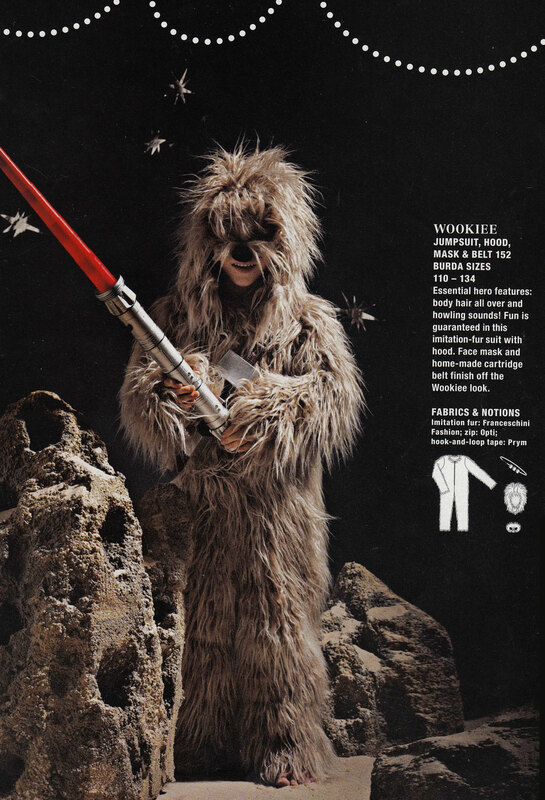 a wookie jumpsuit! Thank you Burdastyle. Really. Thank you!! The only problem I had was that the size only went up to age 8. My daughter is 9 but a good 4 inches taller than a regular 9 year old! And so I cut and spread and taped and so properly graded the jumpsuit pieces. But then I looked and shook my head in disbelief at the sheer size of the pattern and took out an inch and a half. Well you can guess the rest. The first test garment was too small. But no biggie because it was only a tester and better still made the basis of a Thing One costume for her bestie! Bestie’s clever mum did a very fine job of sewing on the the all-important detail as well as taking care of the gorgeous Hermione Granger! So once I added those inches back in I just cut and sewed… and got fluff everywhere! The good thing about this stuff is there is no necessity for neatening of seams, no hems and no need for careful catch-stitching. I actually did double interface the ears with sew in canvas to make them stand up but not be too stiff. The zip was surprisingly ok to sew in, by hand but trimming the fluff so as not to catch on the teeth was really annoying! I can’t take all the credit for this one. 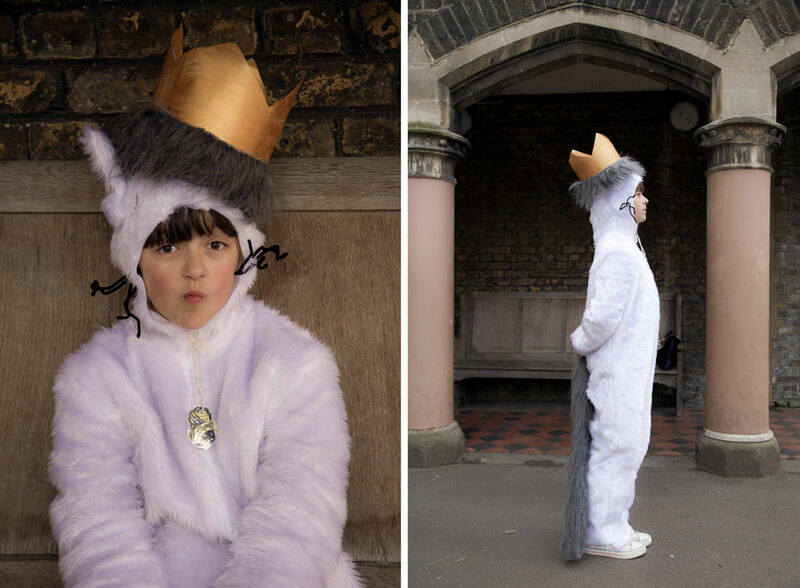 LMO made and hand painted her own fabulous crown and check out that wonderfully fluffy tail. A tail that Max himself would have been soooo proud to wear. Mr Ooobop himself took on this task while I was at work. He chose the fur and shaped it perfectly before stitching it with his own fair hands. I am so uber impressed. I think we can safely say that Little Miss Ooobop was suitably impressed too! 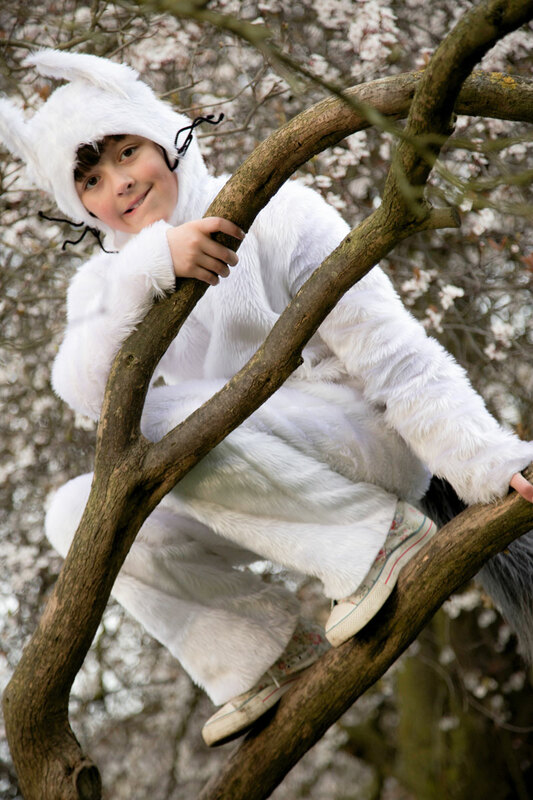 And what better place to hang out after school than the local park, in the trees, being photographed by her multi-talented dad! 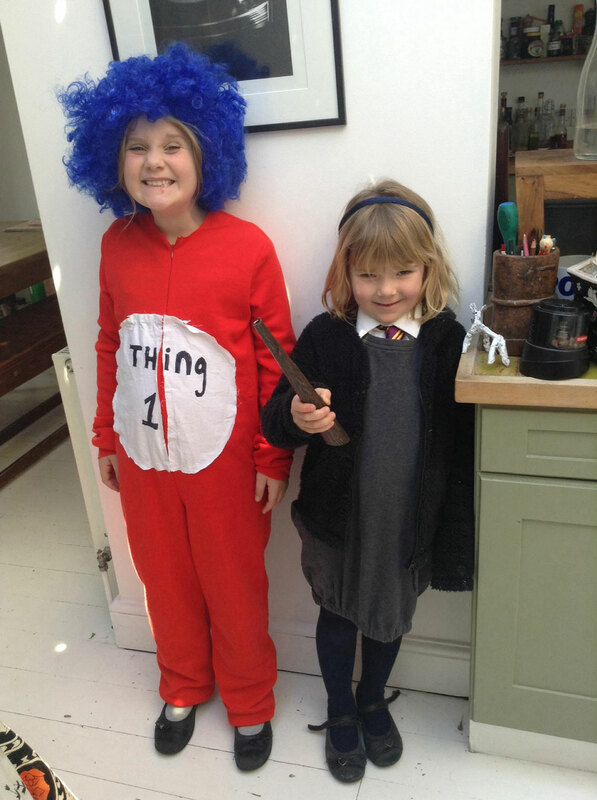 Hope your tales of World Book Day were as fun! And wishing you all a lovely sunny weekend wherever you are. Enter your email address to subscribe to ooobop! and receive notifications of new posts by email. Sign me up to ooobop! Flora – my new bestie! Mom, BurdaStyle is on the Phone for You!!!! !